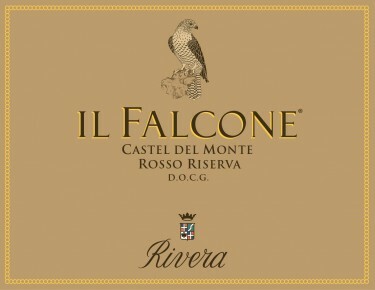 Il Falcone is one of the most prestigious red wines of Puglia whose name was chosen by Rivera to remember Emperor Frederick II of Swabia who built the castle called Castel del Monte near Andria so that he could indulge his passion for falconry. The castle later gave its name to the surrounding DOC area. The wine is obtained with carefully selected grapes sourced from the oldest among the estate’s vineyards at an altitude of 200 metres asl on deep tufaceous and calcareous soils. A blend of the indigenous grape Nero di Troia (70%) which gives its great character and structure while Montepulciano (30%) contributes to its roundness. The ageing for 14 months in oak (50% in barrique and 50% in 30hl French oak barrels) and an additional year in bottle prior to release contribute to refine its great structure and complexity and develop its classic personality and elegance. Dense garnet-red color; multi-layered bouquet of ripe wild berry fruit, leather, tobacco and spice. Well-knit and juicy, featuring light tannins and lots of ground spice accents on the finish. Il Falcone’s complexity makes it the ideal complement to highly-seasoned dishes, such as full flavored red meat, roasts, games and rich pastas with hearty sauces. Serve at cool room temperature and decant for about an hour prior to serving. If stored correctly, this wine will continue to age beautifully over 10 to 12 years after bottling. Starting with the 2011 vintage, Il Falcone Castel del Monte Riserva has been granted the higher DOCG classification. Harvest takes place during the third week in October. Maceration for 15 days at 28C with pumpovers and delestage. 14 months, 50% in French oak barriques and 50% in 30-hl French oak botti; 12 months in the bottle.